University Of Iowa Press, 9781609386023, 102pp. 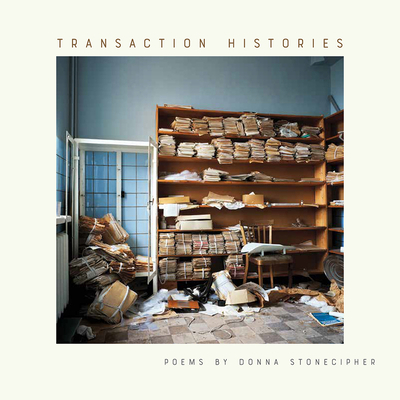 Reveling in the paradox of the formal prose poem, Donna Stonecipher’s Transaction Histories gathers together six series of poems that explore the disobedient incongruities of aesthetics and emotions. Stonecipher’s carefully sculpted forms and exacting language are held in tension with an unruly imagination to provoke a vision of experience densely layered with bodies impinging upon and altering each other, engaging in transactions that unfold in poetically complex and emotionally startling ways. By turns wry and melancholic, playful and acerbic, erotically charged and politically skeptical, Stonecipher’s poems marry a deeply felt lyricism to a fascination with the mechanisms of narrative. The result is akin to Roland Barthes’s notion of “the novelistic”: writing that flirts with the gestures and spaces of the novel without the trappings of plot, character, or action. Narrative fragments dart in and out of sight, spectral figures and motifs recur in fugal patterns, and habits of ruthless observation are brought to bear on the details of both intimate life and social organization. Stonecipher lays claim to a stylistic achievement and vision that are entirely her own, transparent and elusive, casual in address and rigorous in design. Whether training its eye on fetishized polar bears, illegal garbage dumping, or ideological debates around rose chintz wallpaper, Transaction Histories tracks the fitful and tragicomic relationships that exist among objects, landscapes, texts, and people, and lays bare the ways in which our transactions keep our lives going. Donna Stonecipher is the author of The Reservoir, Souvenir de Constantinople, The Cosmopolitan, Model City, and Prose Poetry and the City. She lives in Berlin, Germany.